Note: this guide pertains to non-tilt double hung windows: windows in which the top and bottom sashes are both movable. 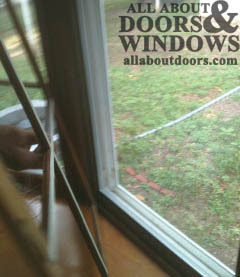 Each sash moves vertically up and down within its own track to open and close the window. 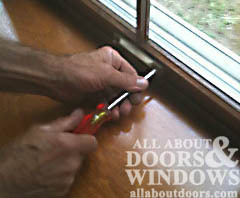 Begin by removing the lift handle on the bottom of the lower sash. This can easily be done with a screwdriver. 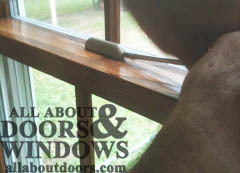 Unlock your window and remove the latch lever on the top of the lower sash. Next, remove each of two screws on either side of the top of the lower sash. Removing these allows you to easily remove the wooden sash liner. Remove the wooden sash liner by gently lifting it up and out of the window frame. (There is a screw on either side that acts as a “guide” for the sash liner to slip into. If you don't lift up before lifting out, you could break the liner.) 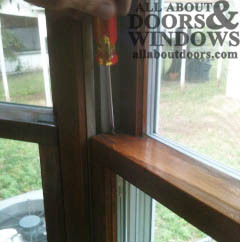 You will be left with the bare window sash, the glass pane and the aluminum hardware surrounding it. 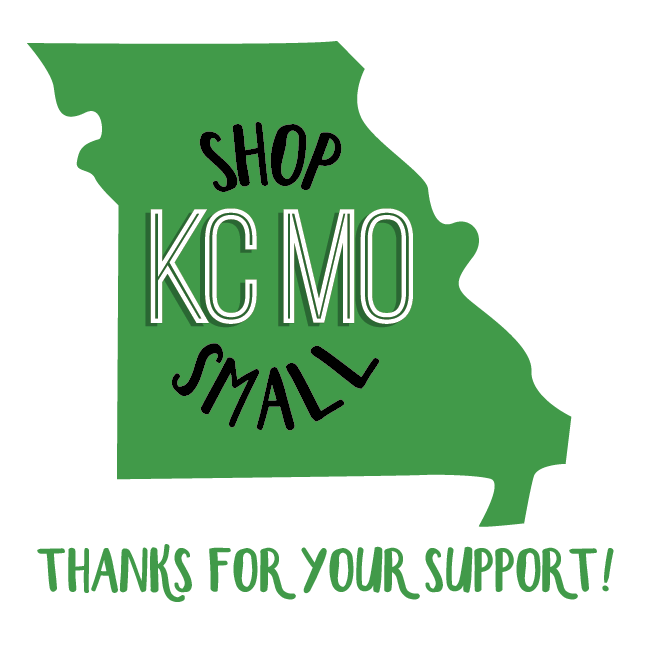 You can now replace your sash and/or balances. The instructions on how to do so are below. Be sure that you you have removed the sash liner as shown above. To remove the sash, you first need to remove one of the vinyl guide bars. These are on either side of the sash and are affixed to the sash by ten total screws. Remove one of the side guides by removing its screws and lifting the guide up and off the sash. Raise the lower sash a few inches so you can get a grip on the bottom of it. **NOTE: Windows are heavier than they look. 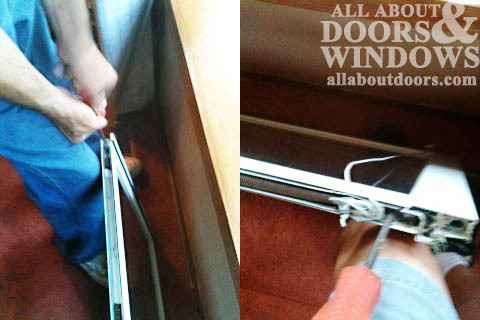 Have someone else help you or simply be aware that when lifting sash out of window, weight normally reduced by spring balancers within the window mechanism will be greatly increased. ** Now we want to maneuver the sash sideways. One side of your window still has its vinyl guide bar. Push the sash into the jamb on this side. This will cause the sash to “clear” the other side of the jamb. Now the window can be pivoted inside so it no longer sits (you can set it on the sill of the window) parallel to the jambs. At this point, you should be able to view the balance mechanism that sits inside the edge of the sash. The sash itself should still be affixed to the jamb via a cord that runs from the balance mechanism within the sash to a small balance plug in the jamb. 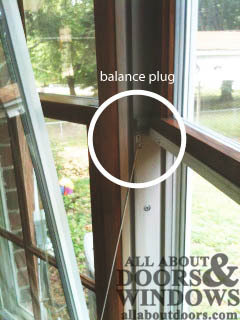 In these particular windows, the channel balancers are housed within the sash you just removed. But before the window can be lifted completely out of the window, you must carefully unscrew the balance plug from the jamb. Use your needle nose pliers to grip the balance cord, and, after the plug has been unscrewed, carefully let the cord back into the balance. This cord is under great tension, and without the use of needle nose pliers or a clamp, will snap back and could hurt you. At this point, if you need to replace the balances in the upper sash as well, repeat the entire process for the upper sash, while your lower sash is removed from the window. Reverse the removal procedure to replace your sashes. Pull the balance plugs out, extending the string, and clamp the string like you did when you removed the plugs. Reinstall the plugs in the jamb. Carefully unclamp the plugs while holding onto the sash. Gently reinstall the sash.